Markets trade-off Friday overhang: Markets traded in something of a vacuum Monday. The themes driving price action were more-or-less those that had determined activity to end last week. The effects of this were pronounced in the Asian session, but much less so in Europe and North America. It stands to reason: Asian markets were still to digest Friday night’s abysmal European PMI figures. That data’s impact is still rippling through the market. Anxieties about global growth and the likelihood for a global recession is the topic of the day. But the material losses stemming from these concerns, though broad-based, have been limited overnight. Wall Street is down but bouncing; European stocks were down; while futures contracts for Asian markets are mixed. Risk-off generally prevails: Fear is demonstrably higher. On balance, safety was generally sought on Monday. 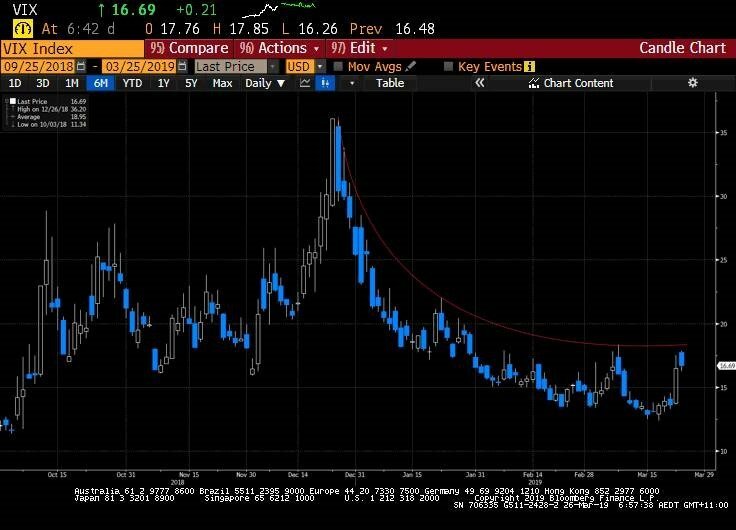 In something of a bittersweet development, the VIX has pulled of its lows, to trade above 16, as traders reprice volatility and risk. In the broader G10 currency complex, the Yen has been led the pack, though its rally has steadied, and it is currently shuffling around the 110-handle. Investment grade credit spreads have widened notably, as speculation about slower growth has fanned-fear regarding the massive US corporate debt burden. And finally, the overnight-drop in the US Dollar, combined with the ubiquitous disappearance of safe-yielding assets the world-over, has pushed gold prices to $US1322 per ounce. Sentiment balances out slightly: A sliver of relief made its way into market participants psyche overnight. Some positive German data helped traders decompress – the bears were made to take a backwards step. Perhaps fortunately for the bulls in hindsight, the lack of major data releases removed the risk of fuel being added to the fire of bearish sentiment yesterday. The business-media cycle primarily concerned itself with interpreting the meaning of an inversion in the yield curve between the 3-year and 10-year US Treasury note. The conclusion sensibly arrived at, after making it through the hysterical headlines, is that no one piece of information tells the whole story; and even if it did, this ****-bit suggests (historically) a recession is still over a year away. Global growth to remain central question for now: This isn’t to suggest that the global growth outlook ought not to be taken as a big-risk presently. It is, and it’s being digested by market participants meticulously. Naturally, equities aren’t showing it that much, but the unfolding dynamic in bond markets, which has recently seen global yields tumble to multi-year lows, is still in motion. The momentum behind this move diminished slightly last night, leading some to call for a bit of a snap-back in the very short term. However, the trend is firmly in place: yields are falling the world over as traders position themselves for the combined effects of a deterioration in economic activity, and subsequent interest rate cuts from the world’s biggest central banks. Australian bonds rally: Such an appetite for relatively safe bonds manifested in our own markets, too. There was a sale of 5 Year AGBs, and the demand for the asset conveyed market participants desire for capital preservation. The bid-to-cover ratio out of the auction was a significant 5.61. Aussie bonds have, in a world where government debt is outperforming short term, seen some of the greatest in-flows of late. Catching-up with risk-off sentiment that had plagued markets, yields on AGBs tumbled during yesterday’s trade. 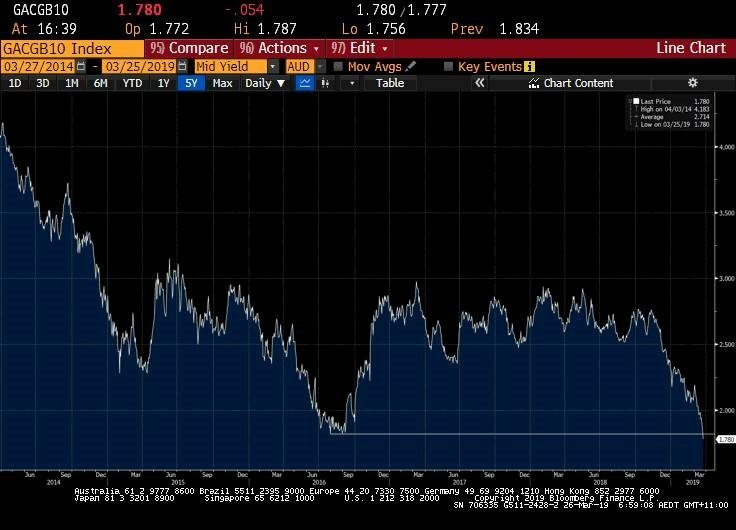 Most noteworthy was the activity in the 10 Year security: it’s yield fell nearly 8 seven basis points to a record low 1.77 per cent. Australian Dollar: resilience and a little luck: Despite the fall in yields on Australian Dollar denominated bonds, at least in the last 24 hours, the Australian Dollar has made its way modestly higher. The “little battler” as its affectionately known has lived up to its reputation recently, managing to hold itself above the 0.7000 handle, even in light of the mounting risk to global economic activity. The primary reasoning behind this has been twofold. First, the yield spread between US Treasuries and AGBs has actually narrowed, as traders price in a US economy increasingly inhibited by the slowdown in global economic growth. Second, the (perhaps) fortuitous lift in iron ore prices, courtesy of persistent fears about production and supply of that commodity. Defensive sectors loom as potential leaders: It’s unlikely that plain luck will keep the ASX200 sustained. A settling of fundamentals is required for that to be achieved. That’s problematic, too: given the dearth of information the world over, the ASX will be reaching for global leads to add to its recent gains. Just for today: SPI Futures are indicating that the ASX200 will open about 8 points higher, as Wall Street stages a quick dash higher into its close. The bulls will be hoping for a bounce today, but judging by US markets’ lead, it’s a bit tough to see where that may come from. A defensive rotation was at play in the S&P500, so chances are a play into yield stocks will be the theme today.